Vintage - Paragon Fine Bone China Coffee Set, in the "Michelle" Pattern, 15-Pieces, a Service for (6) Six (missing 1-Cup), Made in the 1957 to 1963 Time Frame. 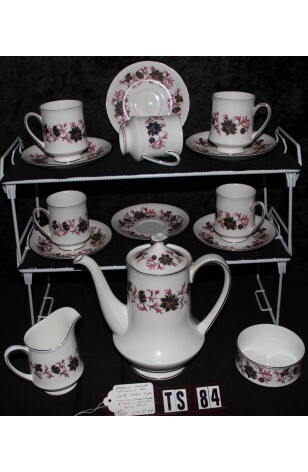 This is a beautiful Paragon Fine Bone China Coffee Set in the "Michelle" Pattern. A lovely White China with Cobalt Blue Flowers, Pink Leaves, Tan Stems and Outlines. The Pattern forms a Band on all items, with 22kt Gold on Cup Feet, Handles, and Rims of all pieces. Spout and Knob on Coffee Pot Lid is 22kt Gold as well. A really attractive Service for Fine Dining, or Casual Get Togethers. This is a beautiful Paragon Fine Bone China Coffee Set in the "Michelle" Pattern. A lovely White China with Cobalt Blue Flowers, Pink Leaves, Tan Stems and Outlines. The Pattern forms a Band on all items, with 22kt Gold on Cup Feet, Handles, and Rims of all pieces. Spout and Knob on Coffee Pot Lid is 22kt Gold as well. A really attractive Service for Fine Dining, or Casual Get Togethers. In Great Resale Condition unless noted below or in pictures.